The Football World Cup is one of the most exciting sports events in the world, and it is going to happen again in 2018. 32 best teams will play with each other to show their skills in the field to become the world champion. Even though the wait for India continues to qualify for FIFA World Cup; the craze for the same never lessens in the country too. The first match of the biggest soccer carnival will be played between Russia and Saudi Arabia. This will be a Group A match and will be played at the Luzhiniki Stadium. On the opening game will be played on 14th June 2018 Thursday. This will be the only game that will be played on the first day, however, in the other days, there are 3 or four matches scheduled every day. The biggest Soccer carnival will last for around a month. The final match will be played on July 15th, Sunday 2018. The two semi-finals will be played on July 10th, and 11th and the match for the third place will be played a day before the finals which are 14th July 2018. All the last four matches will be played at Luzhniki in Moscow and Krestovsky Stadium in Saint Petersburg. 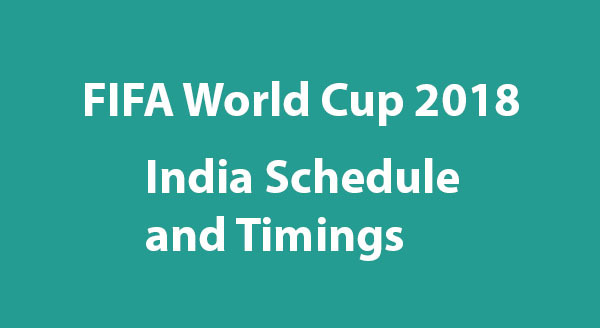 How to Watch FIFA 2018 in India? Even as India didn’t qualify for the FIFA 2018, the craze for the game continues in India also. That is why; a lot of people are looking for the complete details on the match schedule as per IST and how to watch them. Here is the full detail of the same. In India, you can catch the complete action of FIFA 2018 with Sony Ten1/HD, Sony Ten 2/HD channels. You can also live stream the matches with Sony Live App or with the FIFA YouTube channel. The live streaming of the match will begin 30 minutes before the match timing. If you are outside India, just follow complete guide to watching Football World Cup live streaming 2018 here. What is the Match Schedule as Per IST?